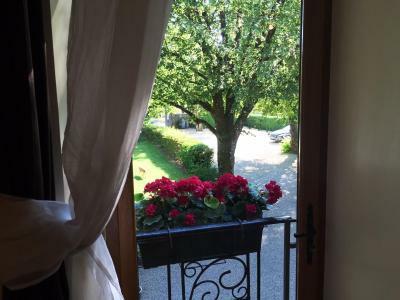 Lock in a great price for Gites du Caylar - Chambres – rated 9.7 by recent guests! Family of 5 (3 young adults) we stopped by for a night but would appreciate to stay longer. 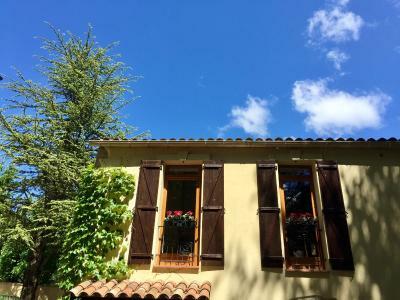 The rooms were all very comfortable, the owner is very welcoming, the decoration is charming, the breakfast is gorgeous, the surrounding is peaceful and the place easy to find. we loved and recommend it. 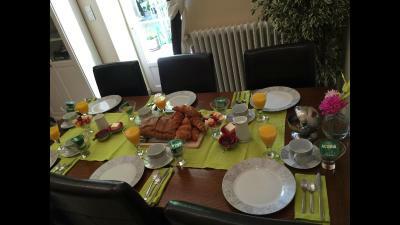 Large, very clean rooms, very hospitable hostess Ruth, delicious breakfast. Best value for money in the area. Lovely garden setting. 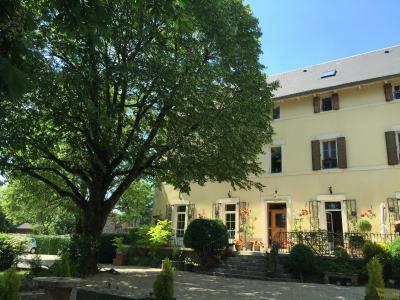 Large Renovated period style country home. 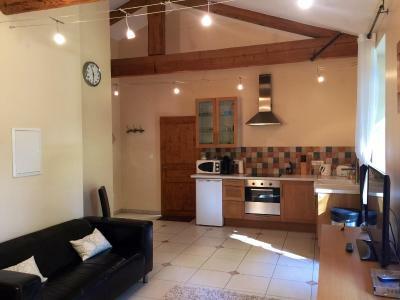 Friendly host, very well presented and furnished property. Easy village to reach, lots to see nearby. Have already decided to return. And there was a covered swimming pool to use! Very clean, very nice place. Swimming pool -30 degrades - all the day. Much beter than in fotos. The garden was wanderful. 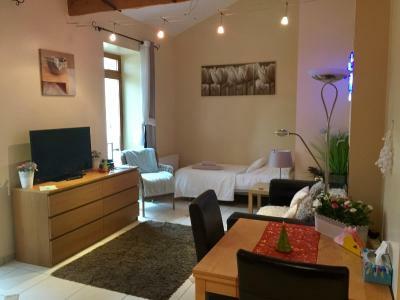 Lovely setting,spacious apartment,and great location for many amazing places to visit. Ruth - the boss - was so helpful, we could not have had a better stay. Wonderful... And there was a swimming pool as well !!!! The accommodation is excellent - very comfortable with lots of little extras. It's in a great location in the centre of the village, with shops and restaurants within walking distance and plenty of interesting places to visit in the surrounding area. The owner was really friendly and helpful and the grounds and pool were the perfect place to relax in. Ruth was very helpful and the room, whole house and gardens were a pleasure to visit. Excellent! We will stay there again....no better recommendation! 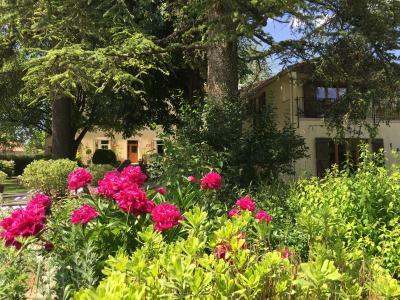 Located 11 mi from Lodève, Gite du Caylar guest house sits in a garden with outdoor swimming pool, sun loungers and terrace. 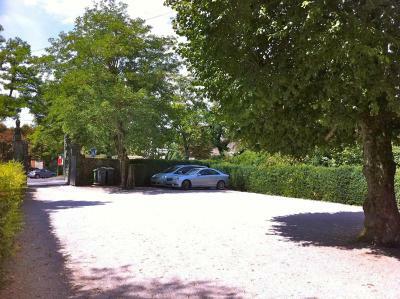 Free Wi-Fi and free private parking are available. The guest rooms come with a terrace, a TV with satellite channels and a private bathroom with hairdryer, free toiletries and shower. 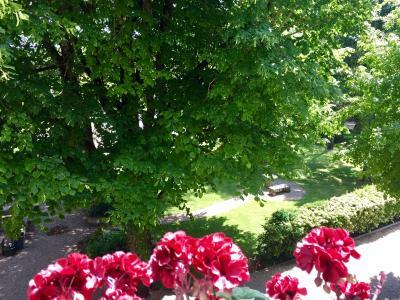 The rooms also have parquet floor and views of the garden. Every morning, a continental breakfast is served. Guests have access to a common kitchen and dining area. They will find a pizzeria 250 feet away and a restaurant serving French traditional cuisine 9.9 mi away. 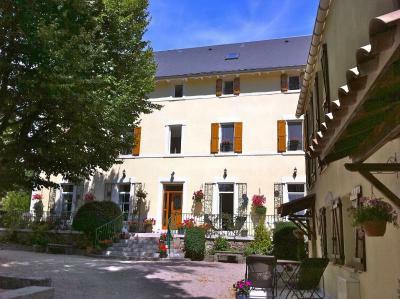 Guests can visit La Couvertoirade village 5 mi away or Pégairolles de l’Escalette 6.2 mi away. Millau Viaduct is 22 mi away, while Millau Train Station is 26 mi away. 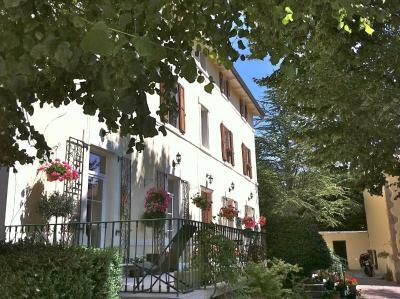 This property also has one of the top-rated locations in Le Caylar! Guests are happier about it compared to other properties in the area. 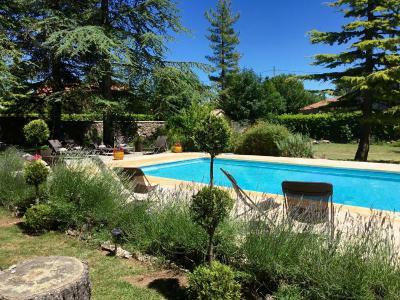 This property is also rated for the best value in Le Caylar! Guests are getting more for their money when compared to other properties in this city. 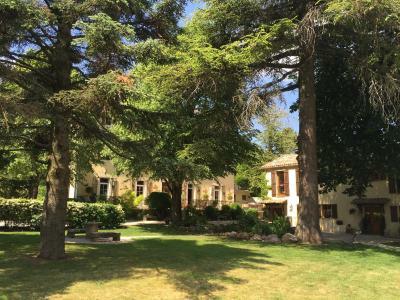 When would you like to stay at Gites du Caylar - Chambres? 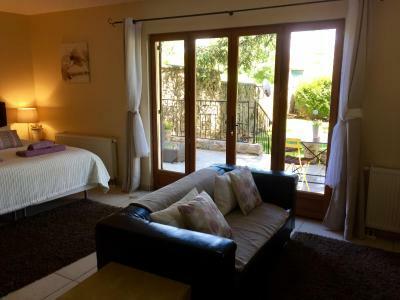 This room features garden views, a bathroom with free toiletries, hairdryer and shower and a TV with satellite channels. This deluxe suite is composed of 2 bedrooms a master bathroom fitted with a spa-bath and a large walk-in shower as well as a double washbasin. Alternative bed arrangements are available for this room on request. This suite has a private bathroom has access to a private area of the terrace with garden views. Free toiletries are provided. This suite is 25 square yards. 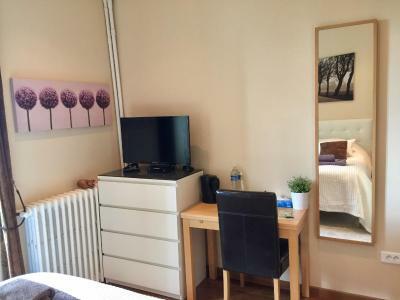 This double room has an external private bathroom, accessible by a small hall. Free toiletries, a hairdryer and an iron are provided. 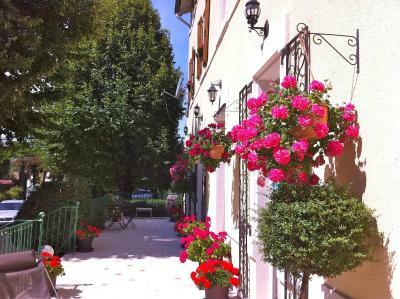 This studio with a private terrace and garden views is located on the ground floor. There is a walk-in shower room with free toiletries, an iron and access to a washing machine. This apartment is located on the ground floor. It features a bedroom and a seating and dining area. There is a shower room with free toiletries, a hairdryer, an iron and access to a washing machine. 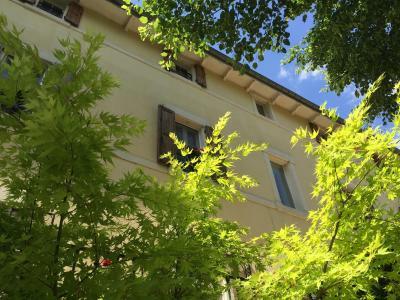 This apartment with garden views is located on the first floor. There is a walk-in shower room with free toiletries, a hairdryer, an iron and access to a washing machine. This two-bedroom suite with garden views is equipped with 2 bathrooms. Free toiletries, a hairdryer and an iron are provided. 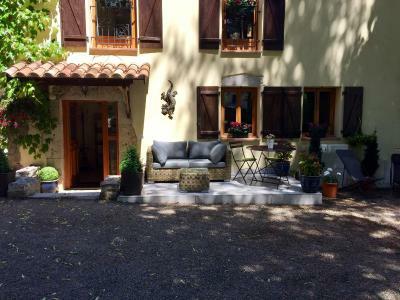 House Rules Gites du Caylar - Chambres takes special requests – add in the next step! 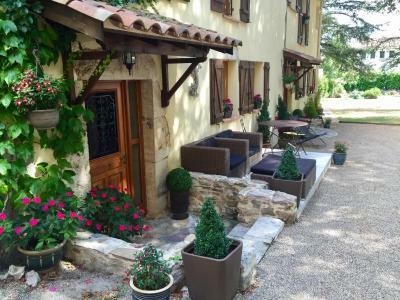 Gites du Caylar - Chambres accepts these cards and reserves the right to temporarily hold an amount prior to arrival. Prepayment via online payment services is due before arrival. Early check-in is possible if requested in advance and is at an extra charge of EUR 10 per person. Excellent location in centre of town not far off the motorway. 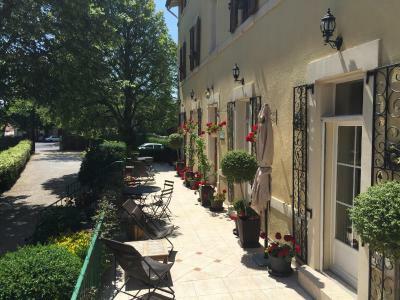 Quiet location but short walk to the town square. Great host and home cooked breakfast. Free parking on the property. Nothing to dislike. For a small village it offered shops and eateries that were variable but ok considering how small the actual village is. Ruth was a very warm helpful and charming host, we loved staying here and highly recommend it. Can't think of anything - except the weather! 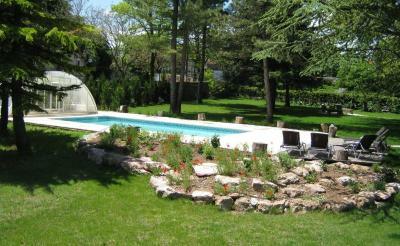 Excellent host, easy to find accommodation, modern conversion with swimming pool.